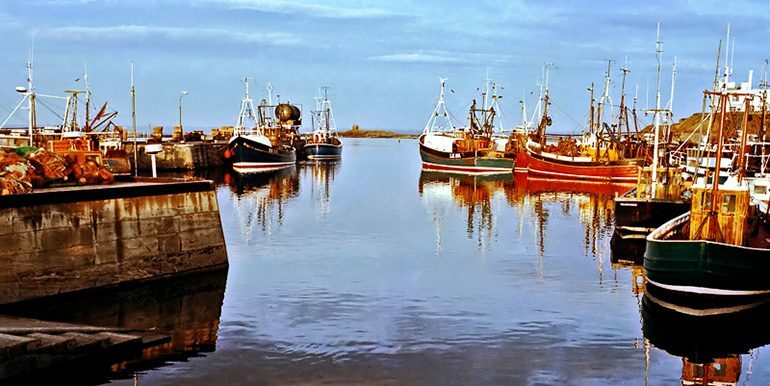 Seahouses & North Sunderland are most famous for the wonderful harbour, sandy beach and boat trips to the Farne Islands and of course, legendary fish and chips! This colourful fishing village has a bustling harbour front and an Aladdins cave of interesting little independent shops in this popular seaside holiday resort. Very popular with families and young children, but there is something for everyone at Seahouses. Seahouses is well served with a wide range of eating places, from traditional fish and chip restaurants through to Indian and Italian bistros and quaint little cafes serving English afternoon tea, there really is something for all tastes. No visit to the Northumberland coast is complete without a visit to this amazingly well-preserved traditional harbourside pub. Authentically themed with all things nautical, reflecting its patronage by thousands of sea-farers since it was first licenced to sell liquor in 1812. The Olde Ship Inn sits boldly above the tiny fishing harbour of Seahouses. It maintains its high traditional standards of food and service. It also has a beer garden overlooking the harbour and is really ‘olde-worlde’ inside. Tel: 01665-720200. Situated with great views of Seahouses harbour and out to sea, the Bamburgh Castle Inn serves great home cooked food from light bites to hearty dishes. You can choose to eat in the Sea View lounge with panoramic views, the beer garden or outside terrace overlooking the Farne Islands. On Sundays they serve a full carvery where booking is advised. Tel: 01665 720283. The Links Hotel has a cosy restaurant offering home cooked traditional good using fresh local ingredients and produce when available. A bar area is also available where you can eat from the same menu as the restaurant. The menu is extensive and will cater for everyone. Located at the top of Seahouses. Tel: 01665 720455. Contemporary Pizzeria serving from their fresh innovative menu and specials, including artisan pizza and baked pasta. They offer pizzas to take away too, as well as gluten-free pizza bases. They operate a ‘Bring Your Own’ option too for a £1 corkage, but they have a drinks and wine menu too. Tel: 01665 721311 or click here to visit their website. Located on the road heading out of Seahouses towards Bamburgh, St. Aiden’s Bistro takes centre stage overlooking the coastline with uninterrupted views of The Farne Islands, Holy Island Bamburgh Castle and further south down the coast. It has big windows all around the restaurant so it can capture the most beautiful sunsets. The bistro is run by Rob and Tegan and St Aiden’s is also a B&B. The food is delicious and home cooked by Rob himself, complete with stunning scenery and gorgeous surroundings makes the bistro an all round winner. Booking is essential and the bistro is open on evenings Thursdays to Saturdays. Tel: 01665 720355 or click here to visit their website. A restaurant with very good reviews, a great Indian restaurant and takeaway in the heart of Seahouses village. Tel: 01665 720345 or click here to visit their website. A good Indian restaurant that serves a takeaway and delivery option as well as a restaurant. Tel: 01665 722999. There are several fish and chip restaurants in Seahouses, including Neptunes, Lewis’ and Pinnacles. All are very good but Neptune’s, close to the harbourside, is the biggest and has a lovely dining area. They are all located in the centre of Seahouses. Newly opened in North Sunderland (and just round the corner from our 5 cottages there; Sandpiper, Longstone, Cobblestone, The Gin Gan and Cuthbert’s Cottage) is Longstone House Hotel with it’s lovely bar, restaurant and beer garden. The beer garden and bar is dog friendly and you can still choose the restaurant menu if your dog is joining you too. They’re open every evening and for Sunday lunch too. Meaning ‘together’ in Italian, Insieme is a gorgeous family-ran Italian restaurant in the heart of Seahouses. As well as the staple pizza and pasta dishes, they also offer a good selection of steaks, fish and seafood dishes as well as catering for children too. There is a nice walk along the coast to Beadnell from Seahouses, by following the harbour front south of the village. It goes along the grassland and then along the coast, where you can eventually get to Beadnell beach. Click here to read some interesting walks to Beadnell from Seahouses with instructions. You can also walk in the opposite direction to Bamburgh which is to the north. Bamburgh is about 3.5 miles from Seahouses and you can walk along the grassland and eventually reach Bamburgh beach and Castle. Click here to read some interesting walks to Bamburgh from Seahouses with instructions. Based in The Fisherman’s Kitchen in Seahouses, complete with the original smokehouses, which have operated on this site since 1843. In fact, the site is even credited as being one of the possible places where in fact the modern “Kipper” was actually invented! Today, they employ the very same methods of smoking as were performed on this site all those years ago. They use traditional oak sawdust which has no additives, preservatives or colourings of any kind which lets the natural flavours speak for themselves. As well as smoked produce, Swallowfish also offer a wide range of fresh, seasonal fish from the north sea and provided by a close network of trusted suppliers. Visitors are more than welcome at The Fisherman’s Kitchen where they have a large display of historic fishing photographs and articles around the walls. Click here to visit their website. Featuring a wealth of interesting local information about the area as well as the history of Seahouses, Bamburgh and Holy Island, The National Trust shop is a great place for stocking up on some local knowledge and history, and of course some top quality souvenirs. It also has lots of information about the birds found on The Farne Islands and about the heritage and breeding sites. It’s located right in the middle of Seahouses, so cannot be missed. There are many other small, independent shops to appeal to all ages, as well as fish and chip shops and the Co-op. Bamburgh B-Fest is a fantastic summer evening music festival happening in the shadow of Bamburgh Castle on Saturday 13th August, hosted by Hospice Care. BFest is a celebration of a multitude of genres of music from classical through to rock and roll and many points in between. Their aim is to give you a great summer evening, lounging on picnic blankets or sitting in deck chairs, enjoying your own picnic, listening to some cool sounds and watching the sun set on Bamburgh castle – perhaps with a glass of fizz or whatever tickles your fancy. At BFest provide the venue, the music and the atmosphere, all you have to do is bring along the things you need to be comfortable and, if you want, your wicker baskets packed with delights. Click here to visit their website and to buy your ticket. Tickets are £17.50. (Bamburgh is just 3.5 miles up the road from Seahouses). On the last bank holiday of the year at the end of August, the RNLI hosts a summer fete from 11am which takes place in the car park behind the lifeboat station as well as inside and at the front of the station. Entertainment includes live band Parish, stalls, side-shows, refreshments, raffles, souvenirs, RNLI Christmas cards and calendars and the Seahouses all weather lifeboat Grace Darling and the inshore lifeboat Peter Downes. At the end of July, Seahouses has a Summer Fayre in the Methodist church with games, stalls and light refreshments. Just behind the church in the village of North Sunderland is the Slate Hall Riding Centre. They offer treks for beginners and experienced riders either along the beach or in the countryside. A very relaxing way of exploring the area ‘on horse’! Seahouses developed as a result of its natural harbour and the fishing industry that grew up around it. In recent years the fishing industry has declined but the townscape, language, industries and character of Seahouses still reflect its maritime origins. Other industries have left a mark, notably lime production, the railways and farming. The religious heritage is both ancient and has strong ties to St. Cuthbert and St. Aidan who brought Christianity to Britain – and more recent, with a Methodist Fisherman’s Choir. Local place names reflect this heritage, so in Beadnell we find Ebba’s Nook the site of St Ebba’s early vocation and Monk’s House – an embarkation point to the Farne Islands – lies between Seahouses and Bamburgh. Nowadays the town is famous as a setting off point for boats to the Farne Islands, a massive seabird sanctuary, and all three themes are encapsulated in the local fisherman’s name for Eider ducks: ‘Cuddy’s Ducks’, after St. Cuthbert who created the bird reserve to protect the ducks when he was a hermit on the island. Seahouses is the largest settlement in the Northumberland Coast Area of Outstanding Natural Beauty, lies on a Heritage Coastline and there are two national nature reserves close by: Lindisfarne and The Farne Islands. Seahouses did not exist until 1889, when the harbour was created to boost the local lime and fishing industries. A settlement grew up around the new harbour, and over the past century Seahouses has become perhaps the most popular coastal resort in Northumberland. The Farne Islands lie two to three miles off the Northumberland coast midway between the fishing village of Seahouses and the magnificent Castle of Bamburgh. The Farne Islands are a hub for wildlife and these rocky island habitats are perfect for seales and many species of seabirds. The Farne Islands have possibly the most exciting seabird colony in England with unrivalled views of 23 species, including around 37,000 pairs of puffin. It’s also home to a large grey seal colony, with more than 1,000 pups born every autumn. Historically, the islands have strong links with Celtic Christianity and St Cuthbert, who lived here in the 7th Century. There’s also a medieval pele tower and Victorian lighthouse here, plus a visitor centre and easy access boardwalk. Many of the islands hide underwater at high tide. Visitors pass lots of these inaccessible islets on boat trips – a short journey to a different world! Open from May to July, Staple Island is home to puffins, shags, guillemots and many Atlantic Grey Seals. National Trust rangers live on the Inner Farne and welcome visitors by boat. They live here for the entire season, overlooking the colony and keeping the wildlife safe. May different birds can be viewed on the Farnes, but beware of the Arctic Turns who will protect their chicks if you walk too close so bring a hat! Longstone Lighthouse stands on the outer group of the Farnes. It was made famous on the 7th September 1838 by Grace Darling when she and her father rescued nine survivors from the Forfarshire, a paddle steam ship which ran aground on Big Harcar in stormy seas. Longstone Lighthouse was manned for 164 years before automation was introduced in 1990. The Inner Farne and Staple Islands are those open to the public, so bring a picnic, relax, and enjoy the best view of Bamburgh Castle and the Cheviot Hills you will ever see. Billy Shiel’s boat trips are the best to use for trips over to the Farne Islands. The also offer Dolphin tours in season, trips to Holy Island and private boat tours too. Click HERE to visit their website. Pre-booking is absolutely essential as in the summer is gets very busy.